Duke Dumont’s forthcoming EP series, Blasé Boys Club, certainly has a storm of anticipation surrounding its release on October 2nd, especially after the UK groove master unleashed “Ocean Drive” as the lead off piece back in July. Soul, funk, and smooth house tendencies all packaged up in an house meets pop output, it was no surprise that “Ocean Drive” has racked up a million and half plays already after hitting #1 on the Hype Machine. To give the track a quick refresher before the full EP’s release, the Duke has employed the help of Australia’s savant of smooth grooves, Hayden James, as well as Toronto future house force, Shaun Frank, to create two of the constituents for the track’s a well-rounded remix package. Both reworks stay in the house realm, yet they sport two robust personalities. Hayden James allows silky guitar strums and delicate synth trills to make “Ocean Drive” even more digestible in a refreshed, indie-house format. With the late-night club rats in mind, Shaun Frank puts a quicker engine under Dumont’s original handiwork driven by pulsating bass plucks and expertly crafted vocal chops to contrive a polished future house remix. 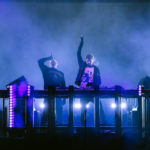 Overall, the pair of producers hit the mark to keep Duke Dumont’s “Ocean Drive” alive and well heading into the fall season.